Show what you’re about and where you’ve been. 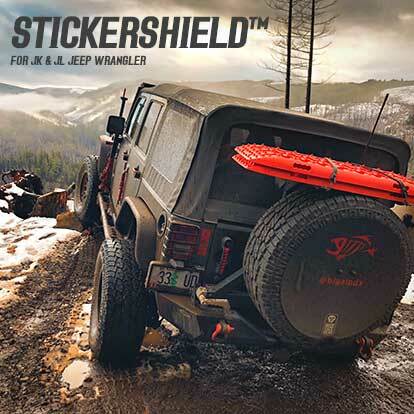 Personalize your Jeep Wrangler® JK and JL without damaging the paint or obstructing your rear view. Our rugged two sided disc shows off anything that sticks. Show funny stickers, favorite brands, destinations or anything you like! Since it’s 2 sided, promote your business on the other side with a graphic made at your local sign shop. Our redesigned attachment makes it even easier and faster to install. Plus, you can specify if you want your StickerShield to come with with a pre-cut hole for the JL’s standard backup camera or not. Choose from the options below. Why did you make the StickerShield™? We’ve been huge sticker fans our whole lives but never wanted to put them on our vehicle’s paint. After looking at our collection from different brands and places we’ve been, we finally decided to do something about it. Because the body panels on the Wrangler were either small, odd shapes, or not visible to others (like the top of the hood), we decided on adding our own panel. To get the most room possible, we focused on the spare tire. After several rounds of prototypes with the goal of making something that was super easy to install and would last, we arrived at what we offer today. Can I install this on a non-JK Wrangler? Great question. As of this moment, our products are only designed for the Jeep Wrangler® JK. We don’t advise installing them on anything else. Is this really Made in the U.S.A.? Yes. We take pride in that and intend to keep it that way. The StickerShield was designed, prototyped and fabricated here in the Midwest. How do I install the StickerShield™? In addition to the step-by-step instructions in the box, we made a short video that shows you everything you need to know (it’s on this webpage). Other than removing 2 existing lug nuts and installing our replacement lug nuts, the rest can be done by hand. The whole process should take less than 5 minutes. What kind of warranty do I get for the StickerShield™? If your StickerShield™ is damaged in any way, please contact us immediately at [email protected] or use this form. We will ask to see a photo of the damage before mailing replacements. Once you install the StickerShield™, we have no way of knowing how it could have gotten damaged, but if something happens to it, please let us know. It’s made of a strong, high-temperature tolerance plastic and will hold up to typical off-highway driving, exposure to the sun and snow. We’ve driven many miles on and off-highway and can say that it doesn’t mind mud, dirt, dust or snow. IMPORTANT: We strongly advise that you remove the StickerShield™ before entering any type of car wash that uses high-power dryers or fans. It’s better to be safe and remove it in case you’re the type who lingers under the fans.